This award will represent the value of the difference in price between in-state and out-of-state tuition. It is equivalent to approximately $5,700 during your first year based on 28 credit hours (the scholarship total will vary based on credit hours taken). The scholarship is renewable the second year if a student completes 24 unique credit hours (superseded credit hours do not count twice) with a 3.0 GPA. If a student does not maintain continuous enrollment they will lose their waiver. All students entering on NIAS funds will receive an extensive session on how to maintain funding for their entire degree. International freshmen who are not required to provide proof of English proficiency because they are from an English-speaking country are eligible with a 3.00 high school grade point average or with an SAT score of at least 1060 or ACT score of at least 21. For international NEW transfer students to be eligible for the NIAS, you must transfer to Northwest with a 3.00 GPA in at least 24 hours of transferable credit and meet the standard English proficiency levels for international acceptances. Transfer students with fewer than 24 transferable hours will be eligible based on freshman criteria. These are automatic scholarships that will be applied to the student's account. There is no application required to be considered for these scholarships. To be eligible for the CS/IS International Graduate Achievement Scholarship, applicants must have a high level of achievement in their academic background and meet requirements for full admission to a graduate program in the School of Computer Science and Information Systems. Students in other graduate programs or students conditionally admitted to the graduate school are not eligible. With this award you will receive $500 toward your first semester tuition. The scholarship is a one-time award and is automatic. No application is needed. Any full-time (6 hrs), degree seeking non-resident or international graduate-level student is eligible for the waiver. Students receiving a graduate assistantship, pursuing a specialist degree or enrolled in an online only program are not eligible to receive the waiver. Students will earn the value of the difference between in-state and out-of-state tuition after completing their first (full-time) trimester at Northwest and earning a minimum cumulative Northwest graduate GPA of 3.30. Students must maintain continuous full-time enrollment in order to renew the waiver for the future trimester. If a student does not maintain continuous enrollment they will lose their waiver. 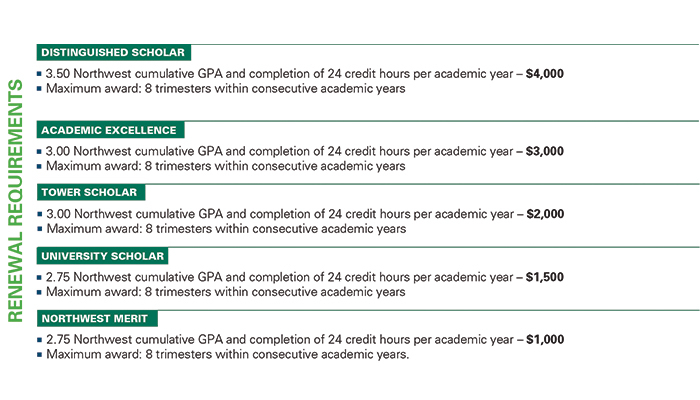 This GPA requirement will be evaluated at the end of each trimester. Students will be evaluated to earn the waiver at the conclusion of the fall, spring, and summer trimesters. Students will be evaluated to renew or lose the waiver at the conclusion of the fall and summer trimesters. Students can earn this waiver for a maximum of one-degree program. Students may be enrolled in undergraduate level courses that fulfill prerequisites for their program as long as they are in an approved Graduate Program of Study. This is an automatic waiver that will be applied to the student's account. There is no application required to be considered for this waiver. Before deciding to attend Northwest, you should examine your financial situation very carefully. The Department of Homeland Security requires Northwest to certify that international students have been accepted for full-time enrollment and have sufficient funding to meet all expenses for tuition, housing, transportation, etc. Northwest requires a Statement of Support and bank statement from the student's family, sponsor, or government. The Statement of Support certifies that funds for tuition, room and board, as well as personal funds are available, and that the student is permitted to export and exchange those funds into the U.S. I-20 form cannot be issued without this certification. The University's sources of financial assistance to international students are growing. There are academic-based scholarships available to students with desirable academic background credentials and also for exceptional scores on the ACT or SAT. However, there is no need-based financial assistance available for international students. United States embassies and major binational culture centers can provide information about other sources of financial aid. Students may wish to contact the Institute of International Education, Latin American Scholarship Program of American Universities, American Friends of the Middle East, African-American Institute and the American-Korean Foundation. Investigate government scholarships from your country.